Bach Choir is delighted to partner with Girasole for a special lunch to benefit the Choir on Sunday, January 27. 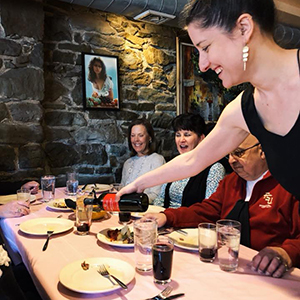 Located in Shadyside, Girasole is one of Pittsburgh’s most-beloved Italian restaurants, where guests dine surrounded by rustic stone walls as if you were in the wine cellar of a villa. Owners Patti and Jimmy Gerasole and their team have prepared a delightful 3-course menu with the perfect wine-pairings. Tickets are $75. 3rd COURSE: Chocolate and walnut torte from Capri or gelato. Did you know that girasole means sunflower in Italian? What could be better in late January? Join us for a memorable afternoon in support of the Bach Choir! Street parking is FREE on Sunday. There is also a parking garage on the next block at 714 Bellefonte Street. Street parking is FREE on Sunday. If you have questions about accessibility, or need an accommodation, please don’t hesitate to contact us at info@bachchoirpittsburgh.org or 412-241-4044.